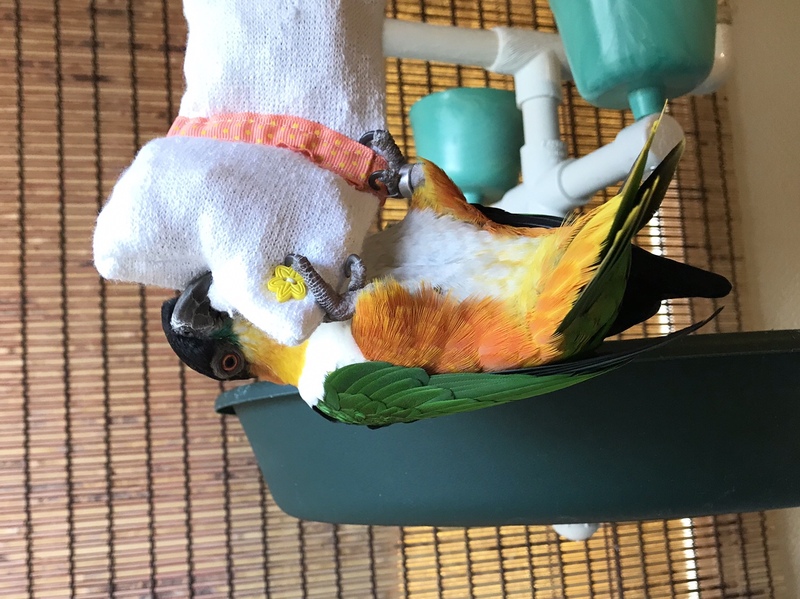 Ravi is a black-headed caique. We adopted him from a parrot rehoming/rescue group. Foraging is a natural behavior for parrots. In the wild (or what’s left of it) they spend their time trying to survive by searching for food. In captivity, it’s our job as aviculturists to give them foraging opportunities. We wrap bits of nut and other food stuff in paper cups and stuff those inside a box filled with shreddable paper. Then we find a way to tie that to a perch or hang it so the parrot has to “work” to eat. But that’s just one example of the many, many, many, many…shooo….many, things we do as bird nerds to keep our parrots in good shape. Some parrots are more puzzle minded. They’re are a variety of puzzle feeders for parrots on the market. Watching a parrot figure out one of these in less time than it took you to stuff it full of food is humbling to say the least. Then there are those parrots, like my black-headed caique, Ravi, who are more search and destroy type birds. He’s got little patiences for figuring out puzzles, but he’ll chew through just about anything to get to a bit of walnut. The thing is if it takes a few moments or 15 mins it’s good for them. They’re smarter than most of us. They require enrichment. They like to work for their food. And in this day and age we know better so we do better. I’m taking the “Great Foraging Chellenge” offered by The Leather Elves. I received my kit last Monday. In it are items to aid it providing foraging opportunities for my birds. Now, my birds already forage. I’ve been providing foraging for them for many years. But we’re always learning and growing and this challenge is intended to freshen things up. So wish me luck! I have to keep specific notes and compare options. I’m looking forward to focusing on the finer details. I’ll post again on this later and show you what and how we did. Incidentally, if you have parrots or are interested in them feel free to email me questions. I have a post all about parrots that I plan to write soon. They’re not a companion for everyone and they’re definitely not a dog or a cat. Milo my 9 year old budgie (Budgerigar).